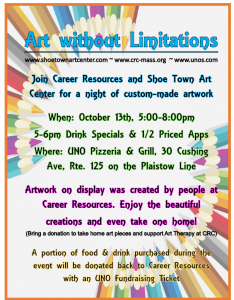 Career Resources Corporation (CRC), and Shoe Town Art Center are proud to announce the first ever “Art without Limitations” event hosted by Uno Pizzeria & Grill. 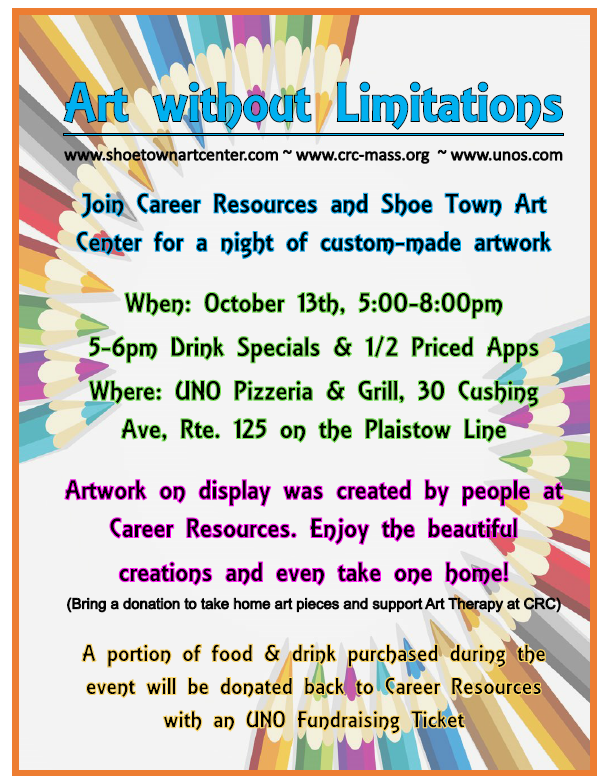 The art show will take place at UNO Pizzeria & Grill, 30 Cushing Ave., off Rte. 125 on the Plaistow line on Tuesday October 13th from 5:00pm-8:00pm. The art show will showcase custom-made artwork all created by the people served at Career Resources. We invite you to come and enjoy the one-of-a-kind creations. There will be additional pieces available to take home for a small donation of $5.00. All proceeds from the event, as well as a portion of any food purchased with a fundraiser ticket, will go towards adding additional clients to the art therapy program hosted at Shoe Town Art Center on a weekly basis. Career Resources has been creating partnerships in the Merrimack Valley for more than 47 years. We focus on linking people to many different opportunities and experiences in their communities, art being just one of them. “Since the beginning of our art therapy program at Shoe Town Art Center we’ve had tremendous interest! We are excited to expand the services to more clients of Career Resources. Creating new expressive outlets for our clients if core to our mission.” Said Day Services Curriculum Coordinator, Erin Robinson. We welcome anyone interested in learning more about CRC and our community engagement programs to join us. For more details please visit our website, www.crc-mass.org or call 978-374-9122 to learn how you can be a part of Career Resources mission to erase limitations. Since 1968, the non-profit Career Resources Corporation (CRC), has been assisting people with disabilities to live, work, and fully engage within their communities. Career Resources offers a wide range of support services to people with disabilities, including those with brain injuries and Veterans of the armed forces. With the most helpful and appropriate services available, across 4 programs, CRC provides opportunities for people to become participating, involved and valued members of their communities. Employment Services provides vocational training services, job placement, and ongoing job support in the Merrimack Valley. Day Services offers customized goal-oriented programs that promote independence and community membership. Shared Living and Adult Family Care are options for people who prefer to live at home supported by their families, or in a family environment. Community Living Services are group residences (24/7) to provide a healthy and supportive living environment. The founder of Shoe Town Art Center, Emily Lawrence-Boulger, believes that every individual is a learner and that everyone has the ability to create. Being in the field of special education for so many years, Emily has noticed there are not many after school opportunities for children and adults with disabilities. This is the primary reason why Emily was inspired to open Shoe Town Art Center. She wanted a place for all people to feel welcome, regardless of their skill level or needs. Emily’s experience and advanced education allows her to work comfortably with students and support a variety of populations including individuals with intellectual, social-emotional and behavioral disabilities. For students with behavioral disabilities, Emily utilizes the principals of applied behavioral analysis to break down the concepts of art projects into smaller meaningful components. This enables her to provide concrete instruction to teach new skills and then build upon them. For individuals with social-emotional disabilities, Emily uses a therapeutic approach focused on creating a comfortable learning environment where her students are free to explore their own creative process. Then, when students are ready to move on in the process, she can begin introducing new lessons and expanding on the students’ knowledge. It goes without saying that every student is unique and will benefit from individualized instruction. We will do our best to accommodate and modify our instruction to meet the needs of each of our students.